The Amaron Gymnasium opened in 1965. 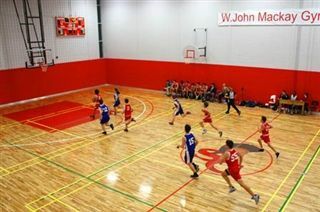 It contains facilities for basketball, volleyball and badminton and includes a viewing gallery, change rooms and a weight room. It is named after Rev. E.C. Amaron, the school’s longest serving headmaster from 1931 to 1954. Originally built as a swimming pool, the building was converted to a gymnasium in 2012 thanks to the generosity of W. John Mackay, an alumnus of the school. In addition to the new gym floor, the building also houses two squash courts and changing rooms.